Odisha has put its best foot forward to woo the world and its investors with a plethora of incentives at the Make in Odisha Conclave this week. With assurances of Rs 1.38 lakh crore worth investment popping up without a sweat on Day 1 itself, the Naveen Patnaik government’s ambitious target of mopping up Rs 2.5 lakh crore worth of total investment seems effortless. But beyond the impressive figures lie the real story of how Patnaik, through a clever mix of personality cult and administrative optimisation planned marquee events like the conclave to reinvent the image of his state (the state will host the Hockey World Cup in the next fortnight), which was infamous for cyclones and starvation deaths. Despite being rich in metals and minerals deposits (Odisha produces a quarter of India’s steel, half its aluminium and almost all of its chrome), the state had lagged behind in wealth generation as well as human development indices like poverty, health and education. Patnaik’s long rule—he’s been chief minister since 2000—seems to have made a dent in that. Poverty levels have fallen while farmer incomes have doubled. Odisha is power and water resources surplus, which is an instant icebreaker for entrepreneurs. Educational institutions such as AIIMS, IIT and IIM have opened up, while the state’s growth rate at eight per cent is higher than the national average. But when the first Make in Odisha meet took place two years ago, the odds were stacked firmly against it. After all, such government-business co-ordination meets were till then the preserve of advanced states like Gujarat and Kerala, and often a dicey proposition when it comes to the actual realisation of the promised investment once the event is over. That is where Odisha was comparatively successful. Its intrepid and resourceful sarkari machinery (Patnaik is believed to give a free-hand to his senior bureaucrats) not only got the big names and big promises out of them, they followed up on the realisation of the promised Rs 2 lakh crore investment and 124 investment intents from 2016. “About two-thirds of these projects are in various stages of implementation,” Patnaik said in his address at the second Conclave on Monday. After the good start, Odisha is now aiming even higher—beyond the Rs 2.5 lakh crore target, the state now also wants to progress beyond just being a raw material provider to conventional industries. The aim is to attract investment in core areas like aerospace and defence manufacturing and food processing, and become a trading post by developing a system of deep water ports. “Apart from (existing ports) Paradip and Dhamra, we are developing deep water ports at Subarnarekha and Gopalpur, a riverine port on Mahanadi river and a chain of 12 other non-major ports,” explained Patnaik. The additional ports will help in faster delivery of raw materials onto the international sea routes on its coast towards manufacturing hubs like China, Korea and Japan. With the lure of immense natural resources and a plethora of attractions like promise of speedy clearances of business proposals, allotment of land, setting up of industrial zones like Kalinganagar, smart city projects in cities like Bhubaneswar and Rourkela, and a skilled mission to train 1.5 lakh in partnership with Singapore, Patnaik and co. ensured that India Inc took note. The attendance of the captains of industry at the second conclave like Mukesh Ambani, Kumarmangalam Birla and Tata’s N. Chandrashekharan was a pointer to that. An even bigger shot in the arm was that all the biggies promised fresh money to be pumped into Odisha—from Ambani who pledged an additional Rs 3,000 crore and pointed out he has big plans to develop his Jio network, to Tata’s Chandrashekharan who said the Tata group will pump in an additional Rs 25,000 crore into the state in the coming few years to take the conglomerate’s total investment to a whopping Rs 1 lakh crore. The turnaround in the perception—if not actual progress—of Odisha is summed up best by mining major Vedanta’s chairman Anil Agarwal. 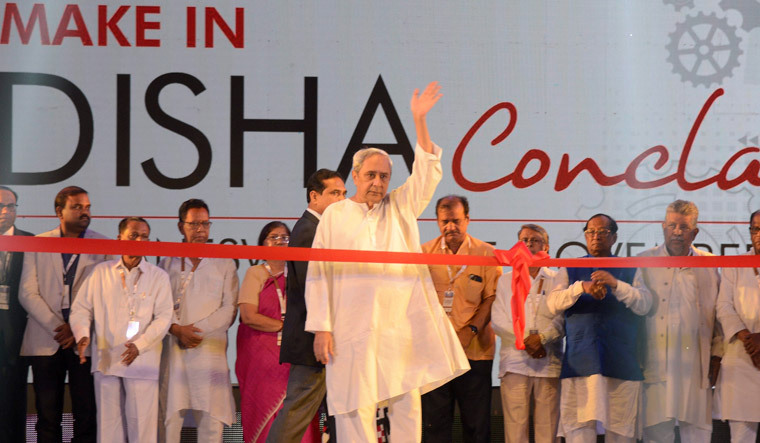 Not only did he promise a fresh investment of more than Rs 6,000 crore at the conclave for Odisha, he also pointed out to the investments his company has made over the past several years in the Kalahandi region of the state. Once a by-word for starvation deaths, Kalahandi is today an area witnessing industrial and infrastructure development. “We have invested almost 20,000 crore in Kalahandi. I think it’s the (most) fulfilling work of my life,” Agarwal says.